So far, so good ... except that several aspects of the much-abbreviated tale are false. Information concering that second carcass was so vague online that I pursued it while researching Globsters, a forthcoming volume from CFZ Press. Specificallly, I contacted the Bermuda National Library, in hopes of pinning down the date when it surfaced. To my surprise, librarian Ellen Hollis reported that local newspapers contain no mention whatsoever of a carcass found at any time in 1995. Neither do library archives at the Bermuda Aquarium, Museum and Zoo. In fact, it seems that “Bermuda Blob 2” did not arrive until January 1997. In short, it was identical to “Bermuda Blob 3”—and “Blob 2” never existed! The rest—at least for now—is silence. 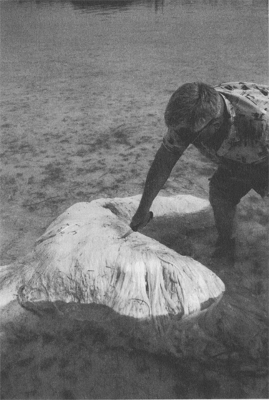 But we know one thing beyond a shadow of a doubt: there was no 1995 “Bermuda Blob.” The local carcass-count stands at two, until such time as the Atlantic Ocean yields another mystery. 1. “Bermuda Blob 1,” May 1988. 2. 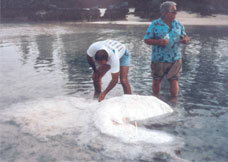 “Bermuda Blob 2,” actually beached in January 1997. 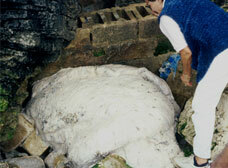 1 “Bermuda Blob,” Wikipedia, http://en.wikipedia.org/wiki/Bermuda_Blob. 2 Sidney Pierce, Gerald Smith Jr., Timothy Maugel and Eugenie Clark. “On the Giant Octopus (Octopus giganteus) and the Bermuda Blob: Homage to A. E. Verrill,” Biological Bulletin 188 (April 1995): 229. 3 Sidney Pierce, Steven Massey, Nicholas Curtisi, Gerald Smith Jr., Carlos Olavarri’a and Timothy Maugel, “Microscopic, Biochemical, and Molecular Characteristics of the Chilean Blob and a Comparison With the Remains of Other Sea Monsters: Nothing but Whales,” Biological Bulletin 206 (June 2004): 125-133. 5 Ibid., p. 127.6 Ibid., p. 125. Have you tried to contact Pierce or one of his collegues to settle your questions Michael? As a Bermudian, all I have to say is "cool". This gives me a side project to explore this summer.